The tenements, owned by well-respected mining identity from Paynes Find, Mr Doug Taylor, and his wholly-owned company, Murchison Earthmoving and Rehabilitation Pty Ltd (MER), are the Currans Find (ML 57/641) and Pinchers (ML 57/642). The deal comes about after Venus Metals built a strong working relationship with Taylor over the last five years. VMC is purchasing a combined 90% interest in the tenements alongside joint venture partner Rox Resources Ltd (ASX:RXL), and will act as manager of the JV. Taylor will hold the remaining 10% stake. VMC and RXL will pay for their equal shares in the tenements through a mix of cash and shares. Having each paid a $5,000 deposit, VMC will issue 450,000 ordinary shares at $0.17 per share and pay $75,000 for its share of acquisition costs; and RXL will issue 7,500,000 ordinary shares at $0.01 per share and pay $75,000, to Taylor and MER, in equal shares at completion and settlement of the transaction. Mr Taylor said, “I believe there are strong similarities with the geology at Currans Find and Penny West, so the discovery potential at Currans is, in my opinion, excellent. I have done the deal with Venus and Rox to become part of the bigger picture that Venus and Rox have now established at Youanmi with their excellent deal to jointly acquire the Youanmi Gold Mine with the aim of re‐establishing the gold mine. 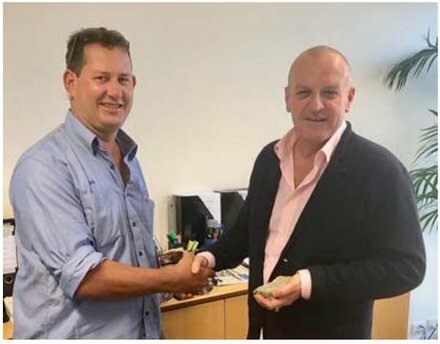 Mr Matt Hogan, MD of Venus Metals said on signing the deal “I wish to thank Mr Taylor for recognising our great efforts and his understanding of what is now transpiring at the historic Youanmi Gold Mine”. Hogan confirmed that drilling will commence at Currans in about four weeks once approvals are in place. The two tenements, Currans Find and Pinchers, are strategically important for VMC, located in the central part of the Youanmi Project within and surrounded by VMC-ROX joint venture tenements. 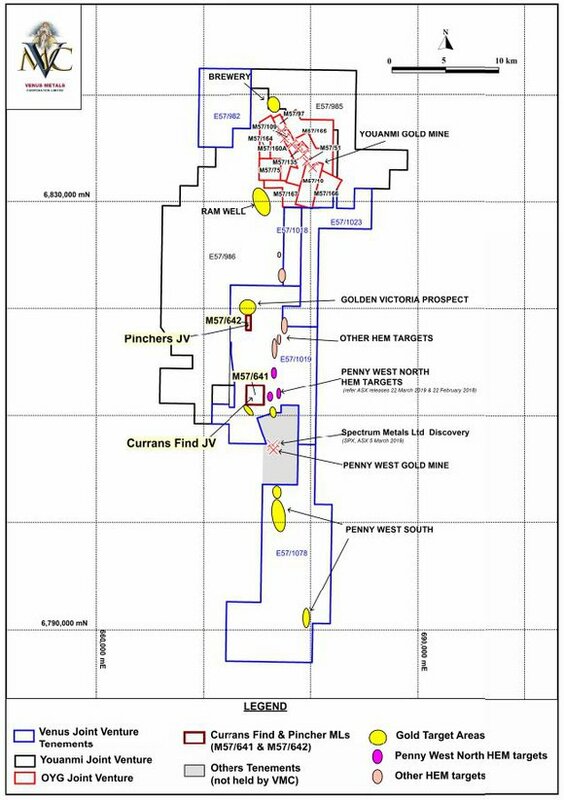 This is a highly prospective area as Currans Find lies along strike and only five kilometres from the high grade Penny West Deposit where a promising new discovery was made in early March, followed up by the release of outstanding early stage assay results, including 5.0 metres at 28.9 grams per tonne gold. As indicated below, Pinchers lies five kilometres directly north of Currans Find. Spectrum Metals Ltd (ASX:SPX) is operating that project, and the fact that its shares have increased seven-fold since the start of March speaks for itself. Gold mineralisation at Currans Find is hosted in multiple ENE‐trending quartz veins within mafic and ultramafic rocks. These rocks are also host to the Penny West and Columbia –Magenta deposits south of Currans Find. It is a feature of the deposits hosted in the ultramafic rocks that they show significant high grades. 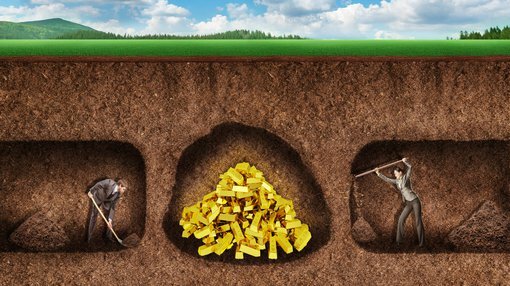 There are about 11 historically known quartz reefs associated with old workings and all are mineralised with a significant amount of gold. The auriferous quartz reefs are striking 040 degrees – 090 degrees and almost all of them are dipping to the south east. Many of these quartz reefs are either truncated or offset by sinistral faults or shears that could be also mineralized between offset reefs.